The New Ballagh Centre is an old Church of Ireland chapel. The chapel was originally opened in 1851. The last service was some time in the early 1960's, and the chapel was closed. By the mid-1990's it had fallen into disrepair and was no more than four ivy clad walls with no roof, doors or windows, and in danger of collapse. Rossinver Community Development Company approached the Church of Ireland and secured a lease on the property. Using grants from various sources they restored the chapel as The New Ballagh Centre, a multi-purpose community resource centre. You'll find some interesting historical information about New Ballagh Centre and its prior incarnation as a Church of Ireland chapel. The first Protestant settlers arrived in the area of Ballaghameehan around the 1640s when twenty-four planter families were brought from Scotland, Wales and England. Many of them are believed to have followed Sir Frederick Hamilton, the Lord of Manorhamilton, who arrived from Scotland around 1640. Sir Frederick was responsible for the building of Manorhamilton Castle. A Protestant school had been built in the area before 1830. It had two classrooms, but only one was ever used. The first teacher was a Mr. John Carson. 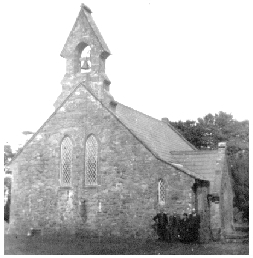 In 1850 construction was commenced by a firm of Belfast builders on a Church of Ireland chapel in the townland of Tullyskearney, just across the road from the schoolhouse. This new chapel, which is said to be one of only two of its kind in the country, was given no other name than Ballagh Church. The construction was completed in 1851. Sandstone, said to have been cut in Belfast and transported to the site by train, and horse and cart, was used for the quoins (corners of the walls), windowsills, rybats (uprights around the windows), arches and keystones, capping stones, bell tower entrance steps and landings. Rev. Ennis is second from the left. Clay bricks were used in the building of the arches, sides of the windows, and the doorways. The remainder of the walls (the “rubble”) was built with a very hard but brittle local blue limestone. This stone cannot be cut easily by hand without it shattering into many pieces. It has to be built as it is, the finished job looking like a sort of jigsaw puzzle. The finish produced, in spite of the lack of any definite pattern, is very pleasant, and the whole building blends well into its surroundings – which is not something that can always be said of a lot of more modern buildings. There is some dispute as to where the blue limestone came from. Some say much of it came from the monastery ruins on the site of the nearby Saint Molaise’s Well. Others say it was taken from the Ballagh River and a local quarry. An interesting feature of the church was the under-floor heating – a rare comfort for that period of time. It came up through gratings in the central aisle. There were two fires, one in the vestry and in the church, which provided the heat. A graveyard surrounds the church on all sides. It is claimed that burials have taken place on the site from at least as early as the eighteenth century. The first rector appointed to Ballagh Church was a Rev. Fletcher, who was a travelling rector in the sense that he visited many other small Protestant communities in the area. In 1859 Rev. Smullen bought the Bookshrine of Saint Molaise (Soiscél Molaisse). Dating back perhaps to the eighth century, this was originally a silver lined wooden box with a Gospel inside. When Rev. Smullen purchased the box the Gospel was not inside as it had been lost. The records (Royal Irish Academy, Antiq. Comm., Minutes, Vol. II, p. 172-3, Nov. 26th 1859) state that he paid £45 to a Charles Meehan of Latoon. The Meehan family had traditionally been the keepers of this shrine down through the centuries. Rev. Smullen donated the shrine to the National Museum in Dublin, where it is still held. Rev. Smullen died 12th September 1904, and is buried in the graveyard attached to Ballagh Church. Rev. Scott was originally curate in Kiltyclogher and was later seconded to Ballagh. He was said to have grown grapes on the banks of the Ballagh River. 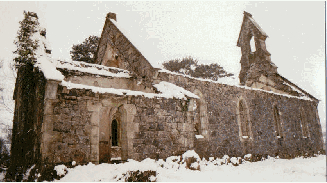 Ballagh Church before restoration work (ca. 1996). There is an unsubstantiated story that Rev. Gahagan may have been involved in a scandal in the area. This story suggests that Rev. Gahagan fathered a child and blamed it on a local man named Erwin. Unable to cope with the pressure of the scandal, Erwin is reported to have committed suicide in the waters of Lough Melvin. The last permanent rector, Rev. Flower, was an Irishman born in Dublin. He was appointed in 1903 and served the parish for more than twenty years. He died in Ballaghameehan in 1926 and is buried in the graveyard attached to the church. After Rev. Flower’s death in 1926, the church was served by travelling rectors (see photo on first page showing Rev. Ennis outside Ballagh Church in 1950) and used for services until the 1960s when, with a dwindling Church of Ireland population, it was closed. The condition of the church deteriorated after that time. The bell, gates, doors and windows were the first to go, and in the late 1980s the roof was removed by the church authorities. By the mid 1990s the condition of the old church had deteriorated considerably. All that was left were four ivy-clad walls. The brickwork on the arches was beginning to crumble, and the likelihood was that within a few short years the main structure of the building would have collapsed. Rossinver Community Development Company Ltd. Approached the Church of Ireland representative body with a plan to restore the church and use it as a multi-purpose community resource centre. A 999-year lease was obtained at a nominal rent. The main two provisos of this lease were that the building would not be used for religious purposes and that the graveyard would be maintained. As part of a cross border project under the Wider Horizons programme, a group of young people from North (both traditions) and South of the border came together to learn construction skills. They helped replace the floor and the roof. The new stained glass windows were designed and put together by two local women (Maureen and Sharron Byrne). They are unusual in so far not a single piece of glass has been painted, which means that the full detail can be seen no matter whether the windows are viewed from outside the church or inside. The rafters in the roof were designed from old photographs of the original church and hand carved in the old Rossinver Parish Hall. The original bell has since been located and, although not yet restored to the tower, it was erected on scaffolding outside the church doors and used to ring in the new Millennium at midnight of 31st December 1999. 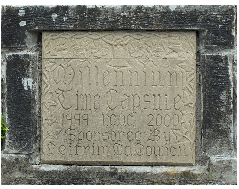 The same night a Millennium Stone was set into the gable of the church. This is a hollowed out block of sandstone. Inside is a lead box containing artefacts of Rossinver, Leitrim and Irish life (newspapers, coins, electoral lists, among other things) from the end of the 20th century. It is intended that this stone stay in place until the end of the 21st century, when the contents may prove of historical interest. The Soiscél Molaisse (the Bookshrine of St. Molaise, a 6th century saint who lived in the area) is an important National treasure, now in the keeping of the National Museum in Dublin. The shrine itself consists of an oblong box made up of a series of plain sheets of bronze to which decorated openwork plates of gilded silver have been attached. One of the long sides is missing. The shrine measures 14.75 cm in length, 11.70 cm in width and 8.45 cm in thickness. The first comprehensive account of the Soiscél Molaisse was published by Margaret Stokes (1871, ‘Observations on two Ancient Irish Works of Art’, Archaeologia, 43, 131-50). The shrine’s inscription was published in detail by Dr. G. Petrie in 1878 (Petrie, G., 1878, Christian Inscriptions in the Irish Language, Vol. II, Dublin). Petrie’s study of the names of those mentioned in the inscription enabled him to date the shrine to between the years 1001 and 1025 A.D. and this dating has been accepted by all subsequent writers. It is a bronze box overlaid with delicate plates of silver, which are decorated with varieties of curious and beautiful devices and it exhibits on one side an inscription which fixes the date of its execution to the early part of the eleventh century. The manuscript which it formerly contained, believed to have been a copy of the Gospels written by the founder of Devenish, has disappeared, but has left to the shrine the popular name of the Sheskil, or Gospels, of Molash. For many centuries its custody was hereditary in the family of O’Meehan, who were the herenaghs or church-tenants of St. Molash’s termon lands of the Ballagh, at the eastern extremity of Lough Melvin in the north of the County of Leitrim. About the year 1843 (Stokes 1868. 276-7) Petrie had the opportunity to examine the shrine in Dublin through the good offices of Lord Dunraven who had procured it on loan from Mr. John Wynne of Hazelwood, Co. Sligo. The keeper of the shrine at that time was a tenant farmer of Wynne’s. This tenant was probably the Mr. Charles Meehan of Latoon from whom it was secured by Rev. Smullen (incumbent of Ballagh Church) for the Royal Irish Academy at the cost of £45.